We ensure all services provided are to their highest quality, giving you a smooth experience of the digital world. We offer competitive prices whilst not forgetting all of your needs and giving attention to detail on all areas of the service. Please feel to browse are recent projects. If you would like a free quote please get in touch with a member of our friendly staff or fill out the contact form and we will get straight back to you. 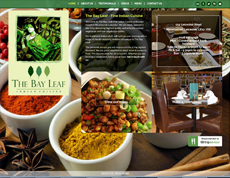 The Bay Leaf, Fine Indian Cuisine restaurant based in Mountsorrel, Leicester. They opened in late 2015 delivering highest quality authentically cooked vegetarian and non-vegetarian dishes. 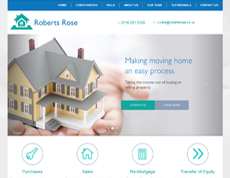 Located in the heart of Leicester, Roberts Rose Partnership Limited has more than 20 years of experience providing exceptional service to home buyers and sellers in the region. 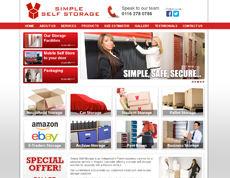 Simple Self Storage is an independent Family business catered for a personal service in Wigston Leicester offering a simple self storage solution for anybody with a friendly service. 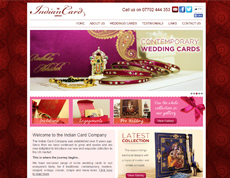 The Indian Card Company was established over 8 years ago. Since then we have continued to grow and evolve and are now delighted to introduce our new and exquisite wedding card collection to the UK market. 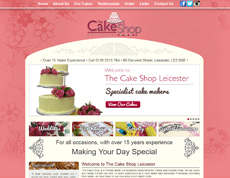 All occasion cake makers based in Leicester. They specialise in designing and creating cakes in any shape or size for all those special occasions, whether it be a simple birthday cake, to the all-important wedding cake. 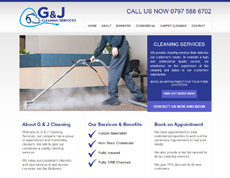 Welcome to G & J Cleaning Services, our company has a group of experienced and trustworthy cleaners. We aim to give our customers a quality cleaning services. We value our customer's interests and give services in and around Leicester and the Midlands. 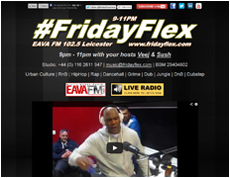 Friday Flex 9pm-11pm at EAVA FM 102.5 Leicester, hosted by Veej & Sush. Bringing you the best of R&B, UK Hip-Hop, Hip-Hop, Rap, Dancehall, Dub, Jungle, Drum & Bass, Dub-Step & Urban Culture. Welcome to ISKCON Leicester, a spiritual centre at the heart of England. International Society for Krishna Consciousness. Founder-Acarya His Divine Grace A.C. Bhaktivedanta Swami Prabhupada. Maiya Therapy offers an accredited mobile massage service, which combines convenience and quality. We provide tailor-made treatments to suit your needs, specialising in stress relief, pain minimisation and total restoration. Just Legal Group is a dynamic legal practice based in Leicester that specialises in Immigration Law, Employment Law and Wills amongst other areas of law. 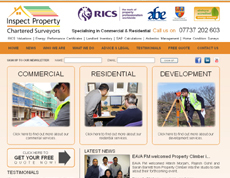 Inspect Property are professional property surveyors in Leicester, they are also members of RICS, and Elmhurts Accredited energy asseeors. 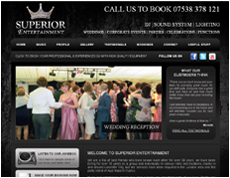 Superior Entertainment is a professional, registered and insured mobile disco company that is owned and operated by three equal partners. They supply DJ's, MC's, Sound Systems, P.A. Equipment and Lighting Solutions for all events. 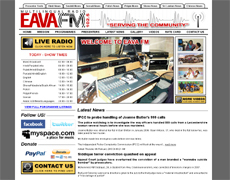 EAVA FM is a multilingual radio station based in Leicester. Check out their website to listen to LIVE RADIO, read the latest news, veiw photo's, videos and much more. 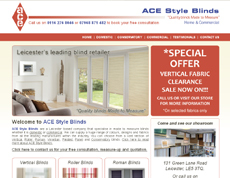 ACE Style Blinds are a Leicester based company that specialise in made to measure blinds whether it is domestic or commercial. They offer a huge range of colours, designs and fabrics from all the leading manufactures within the industry. Sports In You is a Leicester based sports company providing Boxercise, Fooball and Multi-sports for the community. 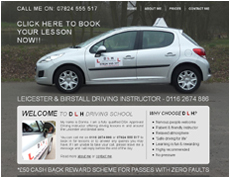 DLH Driving School is a fully qualified DSA Approved Driving School offering driving lessons in and around the Leicester and Birstall area. 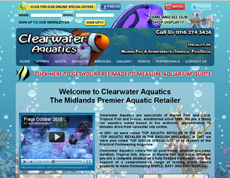 Clearwater Aquatics are specialists of Marine Fish and Coral, Tropical Fish and Discus. 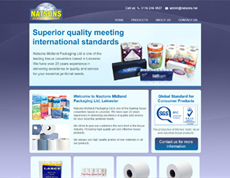 The site covers a full profile of the retailer as well as a great gallery of the shop floor and products. 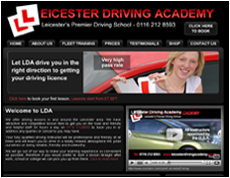 A Leicester based driving school with fully qualified driving instructors and their lessons only start from £7.50. 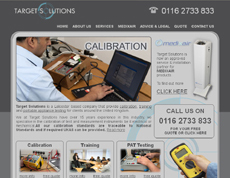 Target Solutions are a Leicester based company that provide calibration, training and portable appliance testing for clients around the UK. Visit their website for more information and get your free quote now. 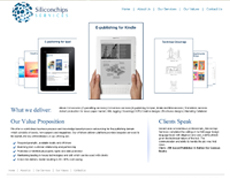 Siliconchips Services provides a world class services for eBook Conversion, Typesetting, XML Tagging & Translation. They are a London based Prepress Publishing company with delivery centre in India. 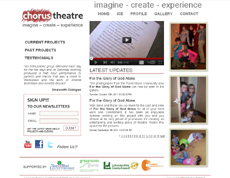 Chorus Theatre was founded in 2006 by Andrew McWilliam to create new and exciting drama projects for young people and the community. Copyright © 2009 VZONE MULTIMEDIA. All rights reserved. Email: info@vzonemultimedia.com | Mobile: 07811 659 364 | Leicester, UK.